This series of workshops creates a space to go deeper with longer holding, different variations and aspects of yoga philosophy. A suggested minimum of strength and flexibility is to be able to comfortably hold a tall shoulder stand for two minutes. It’s advised that you have been recently attending a regular (say, weekly) class for six months and/or have a personal practice. Each class is themed with a particular physical focus and verse(s) from the classical text, Hatha Yoga Pradipika. Each class will provide a fully rounded practice in true Sivananda style. 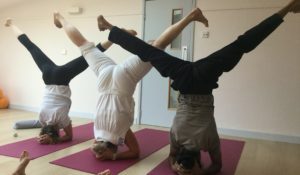 Fiona, the teacher, is a long-experienced yogini and taught the advanced class at the Sivananda Centre in London.